Dr. Jeffrey Dye has been in practice since 2007. 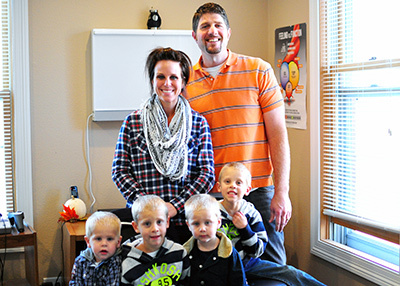 He opened Live Well Chiropractic in 2009 to offer his hometown area a drug-free approach to health with chiropractic care for the entire family. Dr. Jeff has a special focus on pediatrics and pregnancy care, using low-force techniques that are suitable for all ages and levels of health. To understand how Dr. Jeff helps you, we educate you on the importance of your nervous system. This master system of the body is responsible for regulating every process, including your ability to heal. If there is interference or a subluxation in the nervous system, your body can’t work the way it was designed to. You might feel pain, discomfort, disease or even problems such as allergies, asthma and indigestion. By removing the subluxation, Dr. Jeff allows you to maximize not only your body’s potential, but your quality of life. State-of-the-art scanning technology is used to determine your level of nervous system health with the Insight Subluxation Station. Additionally, Dr. Jeff takes X-rays to fully understand any problem areas in your body before treating you, making sure we know exactly what you need to get better. I am under the complete understanding that I work for my patients. And as their employee, my goal is to give them the best care possible and opportunity to succeed. It’s not about me, it’s about YOU. That is our mindset and vision and that builds certainty and trust. We love seeing entire families visit us and reach higher levels of wellness together! Often, we care for multiple generations of the same family, with grandparents, parents, children and great-grandchildren visiting us to ensure their best health. Mothers call us thrilled because their baby slept all night after an appointment with Dr. Jeff, or parents come in exclaiming that their child has made a transformation in their behavior. There is help available that is an effective alternative to riskier options such as surgery. Instead, we’ll allow the body to do the job it was designed to do! Find out what we can do for you. Contact us to book your time with our knowledgeable, friendly team!